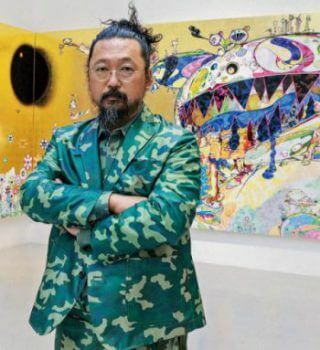 Takashi Murakami was born in Tokyo in 1963 and graduated from the Tokyo National University of Fine Arts and Music. In 1996 he founded his Hiropon Factory, a Warhol-styled studio, now called Kaikai Kiki Co., Ltd. This is a genuine art corporation with numerous assistants producing printed matter and art merchandises including clothing and accessories for designers. Murakami has never separated art and commerce as it was traditionally the case in western culture. He is also internationally recognized for his collaboration with designer Marc Jacobs in creating handbags and other accessories for the Louis Vuitton fashion house. In 2000, he was one of the curators of an exhibition called Superflat, along with Aya Takano and Yoshitomo Nara. This exhibition toured in major museums throughout America and Europe, with the aim of introducing contemporary Japanese artists to an international audience. Maintaining a strong commitment to promoting Japanese art throughout the world, Murakami holds the biannual GEISAI festival in Japan for young emerging talents. With his company Kaikai Kiki, he supports and manages a group of young artists including Aya Takano, Chiho Aoshima, Mr., and Chinatsu Ban.